Southern California has many great sites for owners to hike with their dogs, but the threat of rattlesnakes makes hitting the trail a potentially risky venture. At Oakhurst Veterinary Hospital we don’t want our patients to experience the pain or possible death associated with rattlesnake bites. Awareness, safety precautions and vaccination are among our top strategies when it comes to Rattlesnake Awareness. Keep dogs on a short, flat (non-extendable) lead during hikes. This way your dog stays at a heel by your side instead of bounding through the brush and potentially encountering a snake or incurring other injuries. Walk in the center of the trail instead of at the periphery where you’ll be more likely to come across a snake laying in waiting. Frequently look ahead and down to spot a snakes that may cross your trail or lurk at the trail’s edges. Carry a long and sturdy stick or some other device that could function as a weapon to deter a snake’s approach. Don’t provoke a snake by getting in close proximity for a better look or a photo. When a snake feels crowded or provoked it will be more likely to strike. Be extra vigilant about rattlesnake safety during warmer seasons and hotter times of the day. Consult with our office regarding a rattlesnake vaccination for your pet. 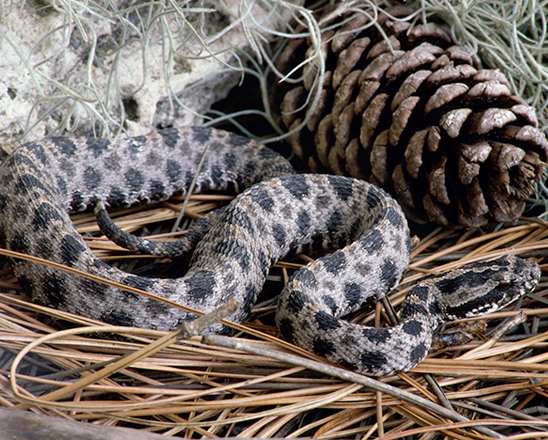 Rattlesnake bites require emergency veterinary care, but a vaccination can lengthen the window of time needed to get to a hospital to pursue evaluation and treatment. Upon biting, rattlesnakes release their venom into the victim’s tissues. Rattlesnake venom is hemotoxic, meaning it damages blood vessels and causes severe swelling at and around the bite site. Rattlesnake venom can cause up to one-third of the total blood circulation being lost into the tissues in a matter of hours. Hypotension (low blood pressure) associated with lack of blood circulation causes reduced delivery of nutrients and oxygen to tissues and rapid necrosis (tissue death). Rattlesnake vaccination reduces the severe inflammatory response associated with rattlesnake bites, reduces swelling and pain, increases the likelihood your pet will survive, potentially shortens the hospitalization time needed for treatment and may decrease the cost of your pet’s treatment.